Bottoms up, LoCo: Cocktail culture has officially reached the exurbs. From east to west, a cadre of creative mixologists is whipping up original cocktails with a focus on fresh, seasonal ingredients and unique (often locally made) spirits. 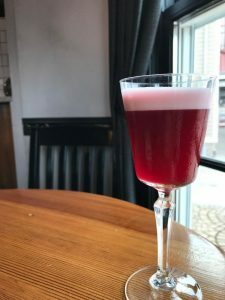 From a fresh beet cocktail in Purcellville to house-infused rums in Ashburn, the art of the craft cocktail has found a home in Loudoun. Copperwood Tavern’s Smoke N’ Barrel cocktail features gin distilled in Culpeper. “We end up with a better product using fresh ingredients. We take the same approach to the cocktail that we do with the menu,” said Jason Miller, co-owner of The Wine Kitchen restaurants in Leesburg and Frederick, MD, and Purcellville’s WK Hearth with its downstairs Hugo cocktail lounge. This fall, Miller’s team is wowing patrons with the rich, dark pink Heart Beet cocktail, made from homemade beet vodka, elderflower tonic syrup and other fun ingredients. This new creation joins other original lounge favorites, like the “Here Today…Cardamaro,” made with bourbon, the Italian bitter spirit Cardamaro and local absinthe from Middleburg-based Mt. Defiance Cidery and Distillery. And while great ingredients are key, having a bartender who engages with patrons is a big part of cocktail culture—especially when the drinks go beyond the old standards. That kind of dynamic mixology is the claim to fame of Jeremy Ross (known to fans simply as Ross), manager and bartender at One Loudoun’s Sense of Thai St. and a local celebrity in the community where he works and makes his home. One of the area’s most engaging barmen, Ross is known for his dealer’s choice cocktails—personally crafted for patrons—and his interactions with patrons from behind the bar. 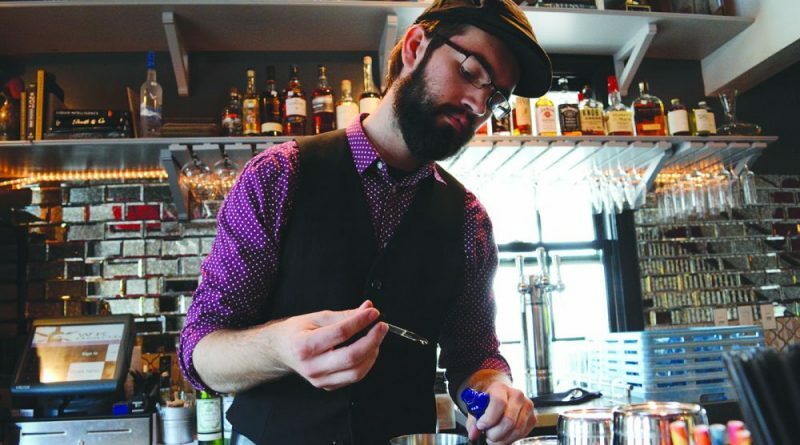 Market Table Bistro bar manager Colt Taylor is passionate about hand-crafted infusions. But Ross isn’t just about style—he has a deep interest to the science of the cocktail and is known for his collection of reference books behind the bar. Recently, Ross has been working on using the sous vide cooking technique (in which food is vacuum sealed and heated in a temperature-controlled water bath) with spirits. Applying the technique to spirits allows for much faster infusion of fruits and herbs. On the Sense of Thai St. drinks menu are daiquiris made from sous vide rum infused with raspberry/mint and strawberry/basil. The daiquiris are named for Dave Arnold, author of “Liquid Intelligence,” an award-winning guide to the science of the cocktail and an inspiration for Ross’s experiments. Like Arnold, many of the brains behind Loudoun’s best cocktail programs have culinary backgrounds. A passion for chemistry and experimentation have been the trademark of Colt Taylor at Lovettsville’s Market Table Bistro—both in the kitchen and behind the bar. The young mixologist, who started out in the kitchen with chef Jason Lage, took over the cocktail program last year, and is focused on local sourcing and made-from-scratch ingredients. “I wanted the bar to match the intensity in the kitchen with a very similar theme,” Taylor said. Taylor is becoming a master of locally sourced infusions. This summer, he bought bushels of local peaches for a peach-infused bourbon and created one of Market Table’s most popular cocktails—the Peach Sazerac. Another of Taylor’s favorites is a homemade orange/nasturtium gin using Seville oranges and the edible flowers grown in the restaurant’s own garden. The nasturtiums’ tangy, citrusy flavor is a perfect match for the juniper notes of the gin, he said. The Heart Beet at Hugo cocktail lounge in Purcellville is made from infused beet vodka and homemade mixers. And guests often fall back on another Market Table favorite, the New Fashioned, a twist on the classic old fashioned, made with a cardamom/blood orange shrub (a sweetened vinegar-based syrup) instead of bitters and Taylor’s own orange-vanilla bourbon. Locally sourced spirits are also big at one of the newest kids on the block in One Loudoun—Copperwood Tavern—which opened its second Northern Virginia location in Ashburn in September. Bar manager Jody Hessler spends time behind the bar on weekends, but during the week spends most of his time beating a path to Virginia distilleries, seeking products that are hard to find on retail shelves. 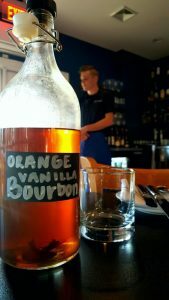 The restaurant worked with Purcellville-based Catoctin Creek Distilling Company to create a specially made barrel of rye whiskey. The Virginia Heritage Cask will be bottled later this month and released in December, Hessler said. And he sources modern-day moonshine from Culpeper’s Belmont Farm Distillery. 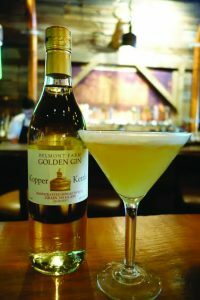 Some of Copperwood’s most popular cocktails include the Bacon Rebellion, a play on the old fashioned featuring homemade maple orange syrup and a bacon garnish, and the Commonwealth Mule made with Silver Fox vodka, produced near Norfolk. For Hessler, who has spent more than two decades behind the bar, the key is in striking a balance a balance—getting creative and original without getting too crazy. “We kind of walk a fine line where we try to make it approachable for the guests and make a nice, balanced cocktail,” he said.